What can a song do? What can a sailboat do? Some would say music exists just to soothe or distract people from their troubles. Some say sailboats are just rich men’s toys. Wrong, wrong. In the summer of 1969 they helped to start cleaning up a river. Pete Seeger, legendary folksinger, songwriter and activist, passed away on January 27 at age 94. Seeger, whose name is synonymous with cause music, had been in excellent health for most of his life and performed concerts and at gatherings up until recently. Together with his wife of 69 years, Toshi Alina Ota, Seeger founded Hudson River Sloop Clearwater, Inc. and the Great Hudson River Revival, the annual music and environmental festival held at Croton Point Park in Croton-on-Hudson, NY. This year’s “Clearwater Festival” takes place June 21 and 22. Fondly known as simply “Pete” by friends and associates, Seeger planted the seed that started Hudson River Sloop Clearwater when he and a few friends decided to “build a boat to save the river” with the belief that a majestic replica of the sloops that sailed the Hudson in the 18th and 19th centuries would bring people to the river where they could experience its beauty and be moved to preserve it. Pete was able to inspire people to make the dream a reality. The keel was laid in October 1968 and christened with Hudson River water. The 106-foot sloop Clearwater was launched on May 17, 1969 at Harvey Gamage Shipyard in South Bristol, ME, and the inaugural sail was to South Street Seaport in New York City, and then on to her permanent home on the Hudson River. Today, the sloop sails the Hudson River from New York City to Albany as a “Sailing Classroom,” laboratory, musical stage, and forum. Since her launch, over half a million people have been introduced to the Hudson River estuary. Many Hudson Valley residents can share stories of the days when they were in elementary school and their first voyage on the sloop Clearwater. Pete and Hudson River Sloop Clearwater played an important role in the passage of laws to clean up the nation’s waters. In 1972, he and the Clearwater crew sailed the sloop to Washington, DC while Congress was debating the Clean Water Act. Pete personally delivered a petition with hundreds of thousands of signatures to Congress, and then held a spontaneous concert in the halls of Congress. A few weeks later, the Federal Water Pollution Control Act was passed. Because of the Clean Water Act, our nation’s waters are far cleaner today and are more fishable, swimmable and drinkable. This landmark legislation has also protected wetlands, so critical to helping filter pollutants and limit flooding. Pete was an important voice among many who demanded government action to clean up our nation’s water and for over 45 years, Hudson River Sloop Clearwater has continued this mission as a force for environmental cleanup and education for the Hudson River and in New York. Hudson River Sloop Clearwater also works to bring justice to the river, its environment, and the people living along it. General Electric’s dredging to clean up 30 years of deposited PCBs from the river is a direct result of Clearwater activism. The organization is also active in the battle to pass moratoriums on hydrofracking in the region, and outspoken on the many safety issues associated with the problematic Indian Point nuclear power plant in Buchanan, NY. The sloop Clearwater will sail on as a symbol of Pete’s great legacy. She was built to carry out science-based environmental education aboard a sailing ship, and she’s the model for other educational sail programs around the world. 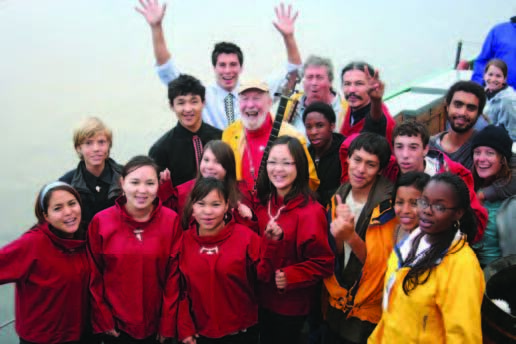 The Clearwater is recognized for her role in the environmental movement, and thanks to Pete Seeger, more than 12,000 school kids who sail on her each year will never see the river in the same way they did before their voyage. Perhaps more importantly, they will be moved to protect the river every time they look at it. Julia Church is the Communications Director at Hudson River Sloop Clearwater. Visit clearwater.org for more information.